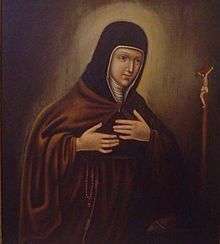 Saint Camilla Battista da Varano, O.S.C. Varano was born out of wedlock in Camerino, Macerata, in the Marche region of Italy, the daughter of noblewoman Cecchina di Maestro Giacomo and Giulio Cesare da Varano, the Duke of Camerino. She was introduced to, and educated in, the splendor of the court. Both her father and stepmother were very fond of her, and she grew up in the splendour of the court, receiving a noble education (as she was the princess) which included grammar and rhetoric. When she was 8 or 10 years old (here autobiography says 9) Varano heard a Good Friday sermon preached by the Observant Franciscan friar, Domenico of Leonessa, who later became one of her many confessors. Domenico had ended his sermon by exhorting his hearers to shed one teardrop for Christ's passion. This sermon made a deep impression on Varano. Later she vowed to God to shed a tear of love for Christ's passion every Friday. Initially she found this troublesome, and she would try to squeeze out a tear, sometimes with no success, although after it had been squeezed she would quickly jump up to run away and play. Initially she had no stomach for the things that were affiliated with the spiritual life such as devotions, and she would make fun of friars and nuns. Varano persevered in her vow, however, and one day came across a booklet that contained a meditation on the Passion of Christ divided into fifteen parts (to be recited like a Rosary) and she began to read it every Friday, while on her knees before a crucifix. She also then began other practices such as fasting on bread and water, keeping night vigils, which she found helped her tears to flow more freely. At this time she continued to spend time playing music, singing, dancing, promenading, and other youthful pursuits abundant in court life that she would later look upon as vanities. During the Lent of 1479 Varano listened to a sermon of Observant Franciscan friar Francesco of Urbino, whom she described as "the trumpet of the Holy Spirit". This sermon struck her deeply. After another sermon by the same friar (with whom she secretly corresponded) on the feast of the Annunciation, March 24, 1479, she then took a vow of chastity; she was 21 at the time. At this same time, she also began to increasingly hear voices inside her telling her that her only hope of salvation was to become a nun. Varano then had a bitter internal struggle, while dealing with sneers and gossip behind her back by members of the court, and her father initially opposed her wish to enter into consecrated life, wishing her to marry. After a confession of her sins to a certain Friar Oliviero on the Octave of Holy Saturday, April 17, 1479, she decided that she would enter the Poor Clare monastery at Urbino, which was under the reform of the Strict Observance of the Order. During the next two and half years before she entered the monastery, she reported having very deep conversions with Christ, and she received many divine visitations. She claimed that Jesus had given her 'three fragrant spring lilies': an intense hatred of the world, a heart-felt humility and a burning desire to endure evil. She composed her first written work in this time, a Lauda (Praises), which was about the joy she felt in knowing that Christ loved her. She claimed that she once saw Christ (in answer to her desire to see Him), but she saw only His back as He was walking away. She also experienced seven months of severe physical illness and depression. When she was 23, Varano entered the monastery in Urbino on 24 November 1481. She described the step in Biblical terms, as having been freed from the 'slavery of Egypt' (referring to the world), and from 'the hands of powerful Pharaoh' (referring to her father), that she had 'crossed the Red Sea' (left the court life), and was 'placed in the desert of holy religion' (entered a monastery). Varano made her profession in 1483 and claimed it was a bittersweet moment for her, as there was much political and religious controversy about her decision to become a nun. It was during her stay at Urbino that she wrote Ricordi di Gesu, a meditation in the form of a letter from Jesus to her. She intensified her meditations on the Passion and claimed to enter more deeply into the mental pains of the heart of Jesus. On 4 January 1484 Varano transferred to the new Monastery of Santa Maria Nuova at Camerino (located near her father's castle), which had been restored by her father in order to have his daughter closer to him. Her father had made arrangements with the Vicar General of the Observant Franciscans, under whose authority the Poor Clares operated, and the pope, in order to have her re-located there. Battista, however, was reluctant to do and moved only under obedience. One of the most significant points in Varano's spiritual life occurred then, when she had a vision lasting fifteen days of St. Clare of Assisi. She wrote that she did not recognize the nun at first, but afterwards she knew that it was Clare, the foundress of her Order, and the experience caused her love and devotion to St. Clare to intensify. It was a few days after this that she had a vision of two cherubim holding her at the bleeding feet of Christ (described below), which lasted two months. She had another vision following this of God's love, which afterwards convinced her of her unworthiness, and she asked God to always remain prostrate at Christ's feet. The next five years she recorded as being filled with inner suffering that gave her a desire to leave the body and be with Christ. In 1488, Camilla wrote I dolori mentali di Gesu nella sua Passione (The mental sorrows of Christ during his Passion), which followed from her long meditations on this topic. It was written as a meditation by an anonymous nun to her abbess, and it consists in Christ's presenting eight of His sorrows: the damned, the elect, his mother, Mary Magdalen, the apostles, Judas, the Jewish people, and the ingratitude of all creation. The following five years were ones wherein she experienced a spiritual crisis. She wrote that she was battling with the devil, as she felt abandonment and desolation while being haunted with temptations to rebel against God and to disbelieve the scriptures. During this period, between February 27 and March 13, 1491 she composed 'Vita Spirituale', (Spiritual Life, or her Autobiography) which was a long letter to Domenico of Leonessa (the preacher who had inspired her tear drops as a child). In the letter she told him how he had inspired her spiritual life and expressed his gratitude to him. She thought that this would be her last testament before dying, but she was to live on for another 30 years. In 1492 she met Don Antonio, a Spanish Olivetan monk, who became her spiritual director for four years. She was elected abbess of her monastery in 1500 (she had been made Vicar in 1488), and she was elected again in 1507, 1513 and 1515. In 1501 Duke Giulio Cesare was excommunicated by Pope Alexander VI for hosting enemies of the pope and for allegedly assassinating a cousin of the pope. The papal forces, led by Cesare Borgia, captured Camerino in 1502 and he and his sons were killed. Mother Battista fled the city and found refuge in the village of Atri, in the Abruzzo region of the Kingdom of Naples, with the Duchess of Amalfi, Isabella Piccolomini Todeschini, staying there until 1503 when she felt safe to return to Camerino. 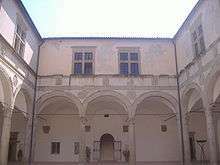 In 1505, Pope Julius II sent Varano to found a monastery in Fermo. She went and stayed for two years. In 1512 through her intervention in San Severino Marche (also in the Italian Marches) she successfully stopped the execution of Napoleone of Camerino for murder. Varano wrote to her brother-in-law, Muzio Colonna, to ask that he spare the inhabitants of Montecchio during his military expedition against Fermo in 1515. In 1521 Varano herself traveled to San Severino Marche to train a monastery of nuns who had just adopted the Rule of St. Clare. She wrote a letter to the Vicar General of the Observant Franciscans, Giovanni of Fano, to whom her last written work 'Trattato della Purita di cuore' was dedicated in the same year. She died in her monastery in Camerino during a plague on 31 March 1524 at the age of 66. Varano's remains were placed to rest in the crypt of the Monastery of the Poor Clares of Camerino. Camilla wrote extensively. Her work includes Pregheria a Dio (1488–1490), Remembrances of Jesus (Ricordi di Gesu) (1483–1491), Praise of the Vision of Christ (1479–1481), and The Spiritual Life (Vita Spirituale) (1491), an autobiography from 1466-1491 which is considered a "jewel of art" and of the spiritual life. In this work, she describes how two seraphim with wings of gold, appeared to her because they were assigned to help her understand the mysterious working of unitive love. Two angels came to me, dressed in resplendent white garments which I have seen only worn by Jesus. They had wings of gold. One of them took my soul from the right side, the other from the left side, and they elevated it in the air, laying it down near the crucified feet of the Son of God made Man. This state lasted about two months almost continually; I seem to walk, to speak, and do what I wished, deprived however of my soul. It remained there where the two Angels had placed it but they never abandoned it. ...They (the celestial spirits) declare to me that they were so intimate with God that God is not ever separated from them. They also explained to me that the seraphim were likewise united to the cherubim in that none of them could ever go without the other to a soul. Completed in 1488, Treatise on the Mental Sufferings of Jesus Christ our Lord (I dolori mentale di Gesu nella sua passione), is considered a masterpiece. It is largely a series of translations of revelations which she received. Also attributed to Varano are three brief hand-written compositions, a short letter to her brother-in-law Muzio Colonna (1515), a Memoria recording her first encounter with the Benedictine-Olivetan monk Antonio di Segovia (1492), a eulogy in honour of the death of the Observant Franciscan Pietro da Mogliano (1491), as well brief prayers, letters, poems, tracts and revelations. Varano wrote in the dialect of the Marches region, while quoting scripture in Latin, which preserved the usage of the language at that period. Her writings represented a high point in the Poor Clare tradition through its emphasis on the following of the "poor and crucified Christ", articulated by St. Bonaventure as a mark of Franciscan life, as well as mystical espousal with Christ. An element of her writing not found in St Clare's was her stress on Christ's inner sufferings and the need to suffer the evil that had befallen Him. Varano was beatified by Pope Gregory XVI in 1843. On 17 October 2010, Pope Benedict XVI canonized her, along with five others. 1 2 3 4 Princess on Earth, Saint in Heaven. (Feb, 23, 2010). Villa, Carmen Elena. Zenit. Retrieved Feb 27, 2010. 1 2 3 New saint was a princess. (Feb 24, 2010). CathNews USA. Retrieved Feb 27, 2010. 1 2 3 4 5 6 7 8 9 10 11 12 13 14 15 16 17 Paul Lachance. Battista da Varano (1458-1524): A Survey of Her Life and Writing as a Poor Clare Visionary. Mystics Quarterly, Vol. 20, No. 1 (March 1994), pp. 19-25. ↑ Carmen Elena Villa (23 February 2010). "Princess on Earth, Saint in Heaven". ZENIT. Retrieved 26 March 2013. 1 2 3 Blessed Camilla Battista da Varano. Accessed Feb 27, 2010. 1 2 Upcoming Canonization of Bl. Camilla Battisa Varano Accessed Feb 27, 2010.